Born in 1970 in Budapest, Zoltan Cser spent his childhood he spent in nature, as his parents were speleologists (cave researchers). His uncle lived in Mongolia, so very early in his age, he was exposed Buddhist culture. At 16, he started to practice Buddhism. He later became a monk and from 2003 he started to practice in the International Dzogchen Community. In 2004, he returned to the Buddhist College to teach and research Buddhist ethics, Buddhist liturgy, meditation and breathing methods and also to lead the Buddhist Pujas at the Dharmagate Church of the practicing Buddhist Community in Hungary. From 2008 till 2016 he functioned as the educational Vice-Rector of the Buddhist College. He is credited with the College’s new educational BA and MA program based on Buddhist Practice, Buddhist Language (or translation) and Buddhist Philosophy. 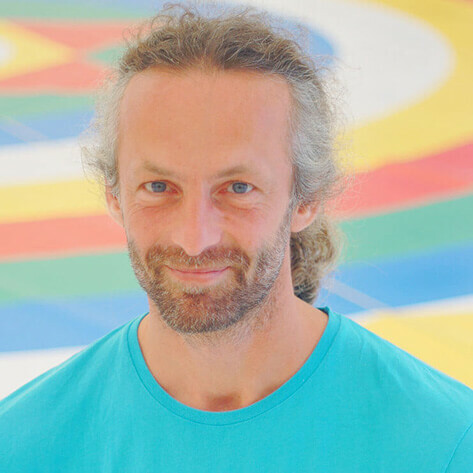 In 2010, he became a Vajra dance Instructor and later Yantra Yoga instructor in the International Dzogchen Community. The Vajra Dance is a meditation practice integrating movement and sound. Its principle is to harmonise and coordinate our energy and integrate all experiences related to our three existences of Body Speech and Mind into the state of contemplation. The Dance takes place on a large Mandala of approximately 100 sq.m representing the correspondence between the inner and outer dimensions of our existence. The Vajra Dance is connected to the ancient Dzogchen tradition of Oddiyana and inseparably linked to the transmission of the Dzogchen Teachings. The Tantra, “The Vajra Dance liberating the Six Classes of Beings into the Six Pure Dimensions” is a Terma from the Tibetan Dzogchen Master Chögyal Namkhai Norbu.